From Camerons Cottage Loch Ness - tour the Romantic Isle of Skye. This trip is best enjoyed on a clear, dry day so do check the weather forecast first. Turn left from Camerons Cottage onto the B852 and follow the road for about a mile or so to the T-junction of the B862 - the road to Fort Augustus and turn right. Well worth a stop after about 5 miles when one reaches the highest point of this road for a good viewpoint & photo shoot. Continue down towards Fort Augustus passing Loch Tarff on your right. Just before you enter Fort Augustus there is another good photo opportunity at the end of Loch Ness looking down towards Inverness. On entering Fort Augustus you will see a large sign ‘Fort Augustus Abbey’ on the right - turn left here onto the A82 main road passing The Lovat Arms Hotel on the right. Follow the road which soon goes over the Caledonian Canal linking Loch Ness to the next loch along the Great Glen - Loch Oich. The road runs parallel with the Loch Oich shoreline to the village of Invergarry. There is a garage on the right just before Invergarry - note that petrol will be more expensive the further west you go so do try and go on a full tank. Just after the garage turn off right onto the A87 – signposted to Skye Bridge & the Kyle of Lochalsh. About 2 miles along this road at Glengarry on the left there is a car park and a relaxing forest and river walk. The road now starts to wind and climb quite steeply above the picturesque Loch Garry. After a climb of about 7 miles along the road there is a parking space on the left with dramatic views & good photo opportunity of Loch Garry – note the small private road bridge crossing the loch which looks like a map of Scotland. Carry on the A87 road down towards Loch Cluanie - at the T-junction turn left on the A87 towards Skye Bridge which is now about 37 miles ahead. Pass scenic Loch Cluanie on the left with several stopping places. Good for photo shoots on a clear day. The road meanders through gigantic mountains on either side- snow capped in the cold months. Pass or stop at The Cluanie Inn for lunch/petrol/shop. Open all day. Further on the road passes through dramatic scenery, engulfed by towering mountains on both sides - the Five Sisters range on the right and The Saddle on the left. Look out for the herd of wild black goats often spotted here. The road follows Loch Duich, a sea loch, on the left. At the end of this loch is picturesque Eilean Donan Castle which juts onto the loch and can only be reached via a causeway. The castle is a good visit & well worth paying the ticket required. The mountains of the Isle of Skye can be seen in the background. The Kyle of Lochalsh is now about 5 miles ahead. This is where you go over the famous Skye Bridge to visit the famous and romantic Isle of Skye. Skye is the largest island of the Inner Hebrides, lying just off the northwest coast of Scotland. It is also one of the most scenic, with several peaks of the Cuillin Hills rising above 950m/3120ft. The bridge was started in 1992 and took three years to complete. It spans the narrow channel known as the Sound of Sleat for 900m/1000yd between Skye and the Kyle of Lochalsh on the mainland. Alternatively you can travel up to the village of Plockton where palm trees flourish in the balmy warm west coastal winds. 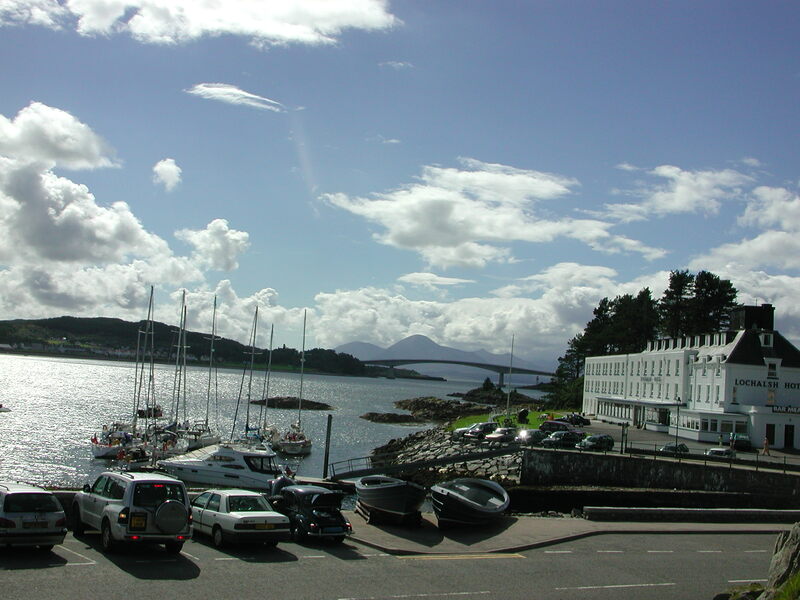 This was the setting for the TV filming of ‘Hamish Macbeth’ in the 1990’s It is a very pretty waterside village with a shoreline onto Loch Carron. Seal trips are available here in season and weather permitting with a very good chance of seeing both Common and Grey seals. There are various ways back home. The more direct route is to return back along the A87 passing Loch Cluanie and the Cluanie Dam where the A87 turns to the right. Do not turn right but carry straight on the A887 to Invermoriston on Loch Ness. At Invermoriston turn right on to the A82 towards Fort Augustus journeying along the shores of Loch Ness. On entering the village of Fort Augustus there is a car park on the right should you wish to park and take a stroll round the village and look at the various boating craft waiting patiently in the lock gates to travel on their way along the Great Glen. After going over the swing bridge which crosses the Caledonian Canal turn left before the right hand ben d where the big sign for Fort Augustus Abbey is on the left. 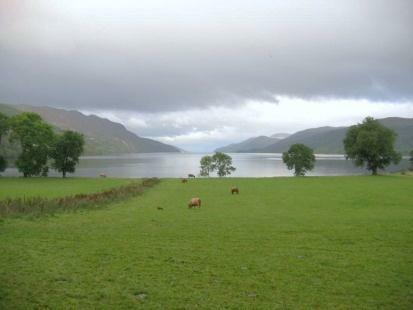 Stop and admire the dramatic view of Loch Ness looking towards Inverness on your way home. The B862 will take you back to Foyers and home to Camerons Cottage.